From Slate Magazine, Rebekah Stout reads her poem "This Horse." From Slate Magazine, David Lehman reads his poem "The Escape Artist." 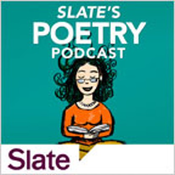 From Slate Magazine, David Rivard reads Edward Thomas' poem "There's Nothing Like the Sun." From Slate Magazine, Eric McHenry reads his poem "How to Steal the Laptop of Your Childhood Nemesis."